Businesses today are succeeding and growing by better understanding their customers’ needs and aligning their operational processes that effectively service the customers. They are creating work processes and methods that are well linked and well operated. Utilizing a system of organizational performance measures, they are also focusing on non-financial indicators to take advantage of key internal and external opportunities and respond to them swiftly. Beyond incremental gains, they are realizing dramatic gains in the critical areas affecting customer satisfaction - cycle time, cost, responsiveness and quality. This document provides the reader with the elements of architectural design and technical specification of iBiz business performance management software. iBiz business performance management software, based on the balanced scorecard methodology, enables the implementation of organizational Performance Systems on top of pre-existing, already running, Information and Workflow Systems that support the daily business of the enterprise. iBiz business performance management software is a web-based application that covers the functions needed to create an organizational performance data mall, measurement tools and associated visual interfaces, making use of the balanced scorecard methodology. iBiz is a Business Decision Support System, through implementing a goal setting process and measuring of the degree of their achievement (organizational performance), either on company level, or on department/employee/process level. The development of iBiz has been based on the worldwide appreciated Balanced Scorecard methodology. 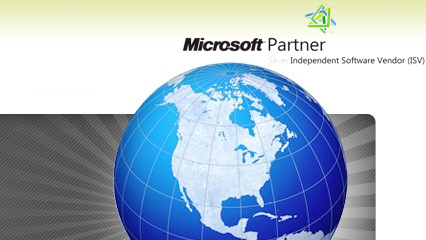 It is developed using the Microsoft .NET technology. The data mall is implemented in an MS SQL Server, which is accessed through Active Data Objects (ADO). The objectives of a balanced performance measurement system are to promote focus and alignment, encourage communication, and provide a ‘forward looking’ vision - in other words, change people’s behavior. A comprehensive view of performance should be developed to include all aspects of the organization’s operation. Organizational performance measurement systems succeed when they provide relevant facts and data about current organizational performance and show what needs to be improved, either immediately or in the future. Measures should be aligned with strategic objectives to ensure that employees’ behavior is consistent with the corporate goal setting process. Most EIS (Executive or Enterprise Information Systems) fall into disuse because they focus on such narrow areas as sales or cost breakdown. Executives need to see ‘the big picture’, focusing on areas which need their attention. They will not (and should not) allocate time to a detailed analysis of one aspect of their business. When a measurement system is built for the first time, there is always a tendency to incorporate measures where data is easily available – which are not necessarily the same with those which help people run the business. This is a temptation that must be avoided. This is normally done through meetings and workshops with the executive group, followed by sessions with each of the organization functional or process managers and their key players. The sole purpose of implementing an organizational Performance Measurement solution is to positively impact people’s behavior. To do this successfully, a well-structured implementation process is needed to be followed and to take account of some simple guidelines. Let's give a brief description of the above architecture. First of all, we have to distinguish two different views in the above architecture: the definition view, and the analysis view. 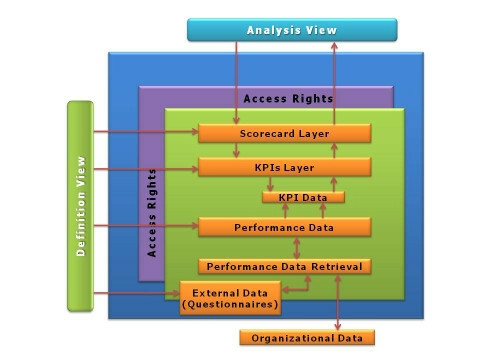 The definition view: refers to the definition of the performance scorecard module functions. The administrator of the system has to make the above definitions at first. He has to define the basic as well as the aggregate key performance indicator set (KPIs) that will be supported by iBiz business performance management software. Next, follows the selection of a key performance indicator set (KPIs) that comprise a specific scorecard and the assignment of a relative importance factor to each key performance indicator (KPI). Finally, the administrator has to define the external data that will be used to iBiz business performance management software, for example the form of a questionnaire. The analysis view: refers to the analysis result of the organizational performance measures. Through the access rights, we have the user or the user group that can see specific results through the analysis view. After the collection of the external and organizational data, we have the retrieval of the performance data and the form of KPIs, which participate in the scorecard viewed by the user. Finally, the view of the analysis results can be done by specified time periods, with a variety of graphical formats such as bar, line and pie charts. In the general context of the goal setting process, the basic as well as an aggregate key performance indicator set (KPIs) is defined. For the basic KPIs, we take into account the definition of a key performance indicator per perspective, its metrics that include worst results, best results, actual results, and normalized scores. For the aggregate key performance indicator set (KPIs), we aggregate all of the key performance indicator scores that comprise a perspective into a single score for this perspective. In iBiz, which is based on the balanced scorecard methodology, there is the selection of a key performance indicator set (KPIs) that comprises a specific scorecard. Additionally, according to the balanced scorecard methodology, except of the contribution of a key performance indicator (KPI) equally to the overall score of a measure on the scorecard, there is an assignment of a relative importance to each key performance indicator. The performance in each key performance indicator will contribute proportionally to the overall score of a specific department of the company. In this function there is the establishment of the different views that can be seen using iBiz. These views will be available per user, per user group or per company department. There is the possibility of specifying time periods for performance targets, so as to enable daily, weekly or monthly, etc. scorecard view. Results can be viewed with a variety of standard graphical formats such as bar, line and pie charts. In addition, an employee is able to see his rank of performance compared to the performance of other employees of the department. Through this view, there's the need to analyze performance results over time and compare current performance with past performance. This necessitates the continuous storage of historical data that is feasible through the viewing interface. iBiz business performance management software is a web-based application developed using ASP technology. iBiz data are stored in an MS SQL Server, which is accessed through ADO. Furthermore, the user access rights have been implemented to support the access rights of the users to iBiz business performance management software. We define all the privileges of a user or a group on the functions of the organizational performance scorecard module. 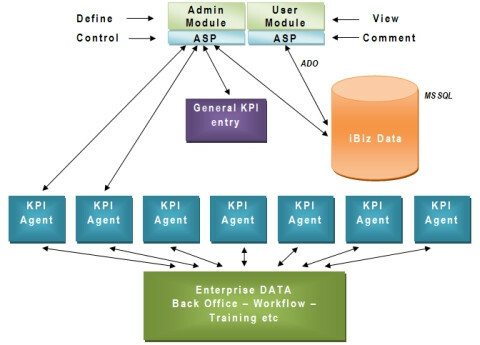 It defines the person who has access to the definition view of iBiz (as shown in figure 3, in the architecture of the iBiz business performance management software), and the users or groups who have access in the different analysis views of iBiz business performance management software. iBiz is created by innovis, in association with iTEAM S.A.